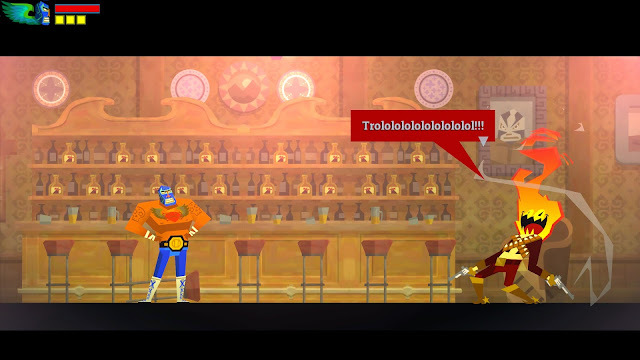 If you remember reading my First Impressions article about Guacamelee! Gold Edition, you'll remember I had nothing but praise for the game, except that I hoped it maintained a linear learning or difficulty curve, and that it was a bit fiddly on the keyboard, my preferred means of playing just about any game (an interesting confession I'm going to make is that I was actually a late adopter of the keyboard and mouse for the original Quake - that's how much I love the keyboard). The plot on face value isn't terribly original - it's basically Super Mario Bros or the typical save-the-damsel-in-distress scenario. Where the game shines though, is in the details. You play the role of a humble agave famer called Juan who dreams of becoming a luchador (basically a Mexican wrestler). You pretty much get that wish but only after dying at the hands of a demon and entering the afterlife. You return to the realm of the living to continue your quest in saving El Presidente's daughter and you end up fighting lots of undead on the way. The game draws heavily on Mexican culture, especially the Day of the Dead festival (Día de Muertos) which means it shares some similarities with Lucasarts classic Grim Fandango - but that's where the similarities end. Another aspect of the game is its humour and its insane number of pop culture references, whether it be an internet meme or a gaming in-joke. You've got several in here including the ORLY owls, Super Mario Bros., Grumpy Cat, gaming blog Destructoid, Viva Piñata and Minecraft, to name a few. So what's the gameplay like? Well Guacamelee! is basically a platformer but with some added mechanics with respect to wrestling moves which aren't only used for combat but are also used for jumping puzzles. I really enjoyed the wrestling combat aspect of the game, even when it became substantially harder a few hours in. What I mean by substantially harder is that combat starts to become a puzzle of sorts in itself. Enemies will have different coloured shields that can only be destroyed temporarily by certain wrestling moves. You'll also discover enemies that exist either in the living world or the world of the dead, but they can still damage you from both worlds, meaning you'll frequently have to switch between both to vanquish all of them. It took me several retries for some of the fights later on in the game but they're doable. Jumping puzzles on the other hand are another story. At the beginning of the game, jumping puzzles seem simple enough and the learning or difficulty curve of the game goes at a linear pace. Unfortunately, as you get further into the game, the difficulty starts to increase exponentially to the point where I eventually came to a section where I spent a whole thirty minutes trying to get past before giving up entirely. That wasn't the first time I was stuck in the game either. Previously I was stuck on a jumping puzzle wondering if I was indeed doing the right thing. I checked a walkthrough and sure enough, I had the right idea - it's just my button mashing wasn't fast enough to ensure the timing was correct. For the final jumping puzzle I did before /ragequitting from the game entirely, I eventually sought help from a walkthrough for this puzzle too only to once again find it was a matter of "if at first you don't succeed, try, try again". I knew what I had to do but the keys were just not responding to my commands or maybe I was off by a split second or maybe the game just doesn't work on a keyboard (despite the game only saying it's "recommended" you play with a gamepad). I did find reviews though stating that even people with gamepads or playing on consoles, found the game increasingly difficult towards the end, so it wasn't just me. I can appreciate I'm not the best gamer when it comes to platformers - I've already admitted that before on this blog. What I can't accept is a game that's nigh on unfinishable for your average gamer which I believe I am (rogue-likes like FTL are an obvious exception of course). I'm not one for destructive criticism - I always like to give some constructive criticism when it comes to games, so if I were in charge what would I have done differently? Well I wouldn't have incorporated such difficult jumping puzzles for mission critical locations. A game that demonstrates this rather well is DLC Quest. You needed to gather enough coins in order to progress the story and while gathering the prerequisite amount of coins for the story was easy enough, if you wanted to grab extra "DLC" or extra achievements that are rewarded to those who search every nook and cranny of a level, the jumping puzzles were obviously harder as a result. Give the player a choice if they want to show how 1337 they are but don't deny your everyday gamer a chance at completing the game. No complaints about the sound effects. As mentioned in my First Impressions article, the soundtrack is inspired by Mexican music such as Mariachi, a style of Mexican folk music. It can be an acquired taste and although I was generally a fan of it at first, it started to become a bit repetitive, especially when you were on the same screen for over half an hour, attempting a puzzle. It's as if those trumpets were secretly taunting you for every mistake you made. 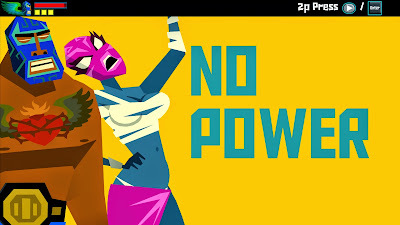 The game has got a very Mexican Art Deco style to the artwork - it's basically similar to Grim Fandango except in 2D. I really dig the art style and its clean lines although some would consider it rather crude. Unfortunately, I ultimately didn't enjoy playing this game. What showed so much promise at the beginning thanks to the great visuals, great music, challenging combat and humourous references, ended up being a grand waste of time. The game is simply too difficult for anyone who isn't a veteran at platform or Metroidvania games (myself included) and eventually I pulled the plug after one too many /ragequits. I'm definitely not going back to replay this game, ever. The game uses a visible checkpoint system which is good because you're able to see where the game actually saves but unfortunately they're occasionally too far from where difficult puzzles occur meaning some backtracking before you're at the right stop to attempt a puzzle again. While this is fine if you're only doing it a couple of times, it can get quite frustrating if you have do it maybe 30 times.